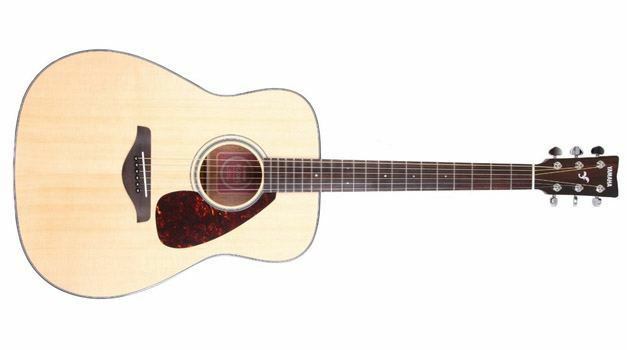 The Yamaha FG700S is a more affordable model acoustic folk guitar that is meant to give beginners a better place to start that is still within budget, yet allows them to get the feel of a better guitar under their fingertips and stall the need for an upgrade. The FG700S was a top selling model for Yamaha and has been succeeded by the FG800. Be sure to check out our review to the 700S, the Yamaha FG800 here. For its price, the Yamaha FG700S is a bit of a conundrum. On one hand, it is a nicely built guitar. It feels well put together, and has the quality craft you would expect of a huge brand name like Yamaha. On the other hand, it does not have that $200 “feel” that you would expect from a guitar of its class. It is still a lower range guitar, but it feels much the same as guitar that go for about $50 less, which makes it a difficult price leap to justify. The aspect that may justify it is the warranty, which unfortunately does not cover very much at all–especially not shoddy construction that can easily be dismissed as damage caused by the customer. 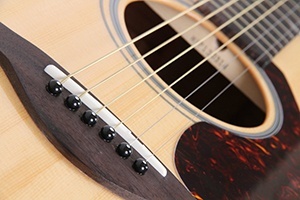 High gloss finish is usually a bad idea on full sized acoustic guitars because it makes them a hassle to handle when sweat gets involved during long playing sessions. Fortunately, the high gloss coating used on the Yamaha FG700S is not a typical high gloss. It does not have the “squeegeed window” feel of other coatings, and it feels much more natural, which is a nice change of pace. The action on the Yamaha FG700S is very good, straight out of the box. It isn’t too low or too high; it hits that sweet spot right in the middle, making it comfortable to play no matter your preference. The intonation, however, is another story: there are some spots on the neck, mostly toward the twelfth fret, where the notes are terribly flat, which causes dissonance within chords. Intonation is usually judged on a case-by-case basis, however over multiple instruments, freshly unboxed, the problem persisted. So while the guitar may feel great to play, it will be necessary to get it set up professional after purchase. Sound is where the Yamaha FG700S shines the brightest. If there is any feature of this guitar that can partially justify the price, it is the tone. For a guitar of its class, the Yamaha FG700S sounds beautiful. Chords are full, and they soar and resonate; notes are clear and easy to pick out, and they don’t lose their presence higher up on the neck. Octaves sound crisp, and there is no warbling quality to them, when the guitar is properly tuned and set up. At its price bracket, the Yamaha FG700S could stand to offer more, but it truly exceeds expectations with its tone.